Decorative Life: 10-16 days or longer. 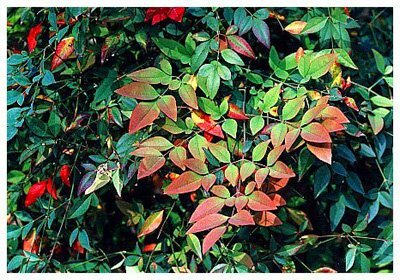 Cultivar and growing season differences can result in significant vaselife variations. Unknown but estimated to be safe to store this species at or near 50F. From “nanten”, the Japanese word for the plant. Loose clusters of red berries appear in autumn. The berries are said to be cyanogenic, producing cyanide if ingested. The specific epithet name domestica means domesticated. When ‘Harbour Dwarf’ and ‘San Gabriel’ were grown as foliage plants under various reduced light intensities, Behe et al. (1993) noted that the lowest light level produced the longest lasting ‘Harbour Dwarf’ under interior conditions while production light levels had no postharvest effect on ‘San Gabriel’.